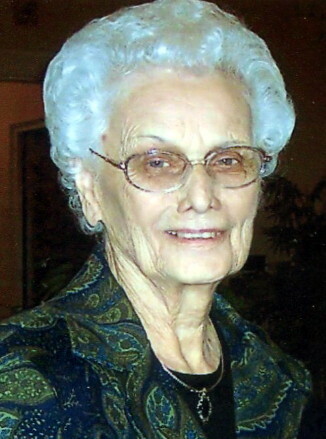 Mrs. Annie Jay East, age 97 of Lebanon, passed away peacefully Saturday, February 9, 2019 at the Lebanon Health and Rehab Center. A native of Pontotoc, Mississippi, she was the daughter of the late Lawrence Nathaniel Dillard and Levester Mae Reynolds Dillard. In addition to her parents she is preceded in death by her husbands, Walter Perry and Owen Leslie East; sisters; Clesteen Russell, Zana Rowzee, Ruby Thompson, Wilma Munn, Trannie Graham, Gladys Gillespie, Lillie Mae Lepard, and Dorothy Dillard, and brother; John Dillard. She was a homemaker and loving mother, grandmother, and great-grandmother. She was a member of Midway Baptist Church in Jackson, MS.
She leaves behind a daughter and son in law, Faye (Bob) Sansing, of Lebanon; granddaughters, Cheryl (Terry) Payne of Asheville, NC, and Leslie (Kurt) Zellner of Lebanon; great-grandchildren, Zachary Payne, Bailee and Luke Zellner; and sister, Mary Joyce Dillard of Pontotoc, MS. The family will receive friends on Sunday February 10, 2019 from 3:00 – 5:00 PM at Ligon & Bobo Funeral Home in Lebanon, TN. Funeral service 12:00 Noon, Tuesday, February 12, 2019, at Lakewood Funeral Home in Jackson, MS, with Bro. Randy Gillespie officiating. Interment Lakewood Memorial Cemetery. Visitation one hour prior to the service. In Lieu of flowers, the family requests memorial contributions to the Lebanon First Baptist Church Music Library Fund, 227 East Main St. Lebanon, TN 37087.